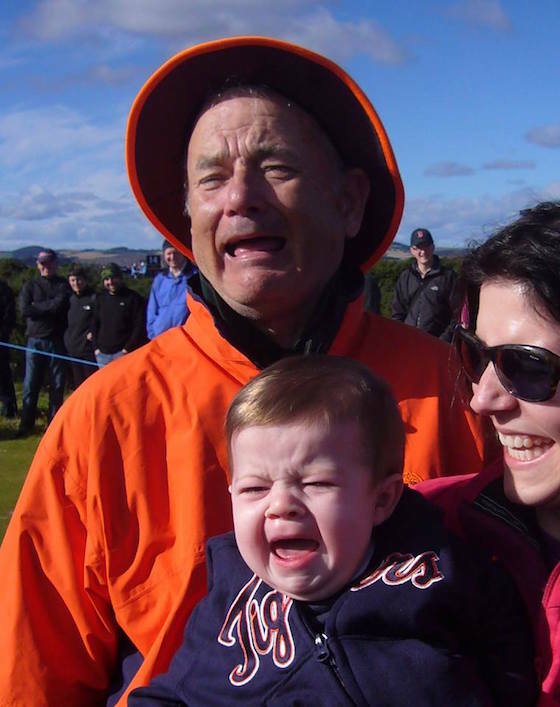 Is This a Facebook Photo of Bill Murray or Tom Hanks? We're living in some seriously divided times, from socioeconomic disparity to political strife. Unfortunately, each day takes us one step further from agreeing with one another. Like the dress that tore us apart in 2015, a new phenomenon is threatening human civility as we know it: is the above photo an image of Bill Murray or Tom Hanks? Three years ago, the Facebook group "Reasons My Son Is Crying" posted a photo of a young boy crying in the arms of a famous man. Based on the caption and the context clues, the man is Bill Murray. But what if, dear readers, it actually wasn't. Thanks to the man's crumpled up face, it's hard to tell exactly who he is. But some commenters believe that the man's nose and eyes are more similar to those of America's dad Tom Hanks. To settle the great debate over whether this is a photo of the White House's baseball correspondent or one David S. Pumpkins, BBC News dug deep. They determined that Tom Hanks was actually in New York when this photo was taken in Scotland. Still, BBC also ran a Twitter poll, and as you'll see below Tom Hanks won by a longshot. As such, we're now having a massive crisis about two of America's most beloved actors. Maybe they've been the same dude all along?